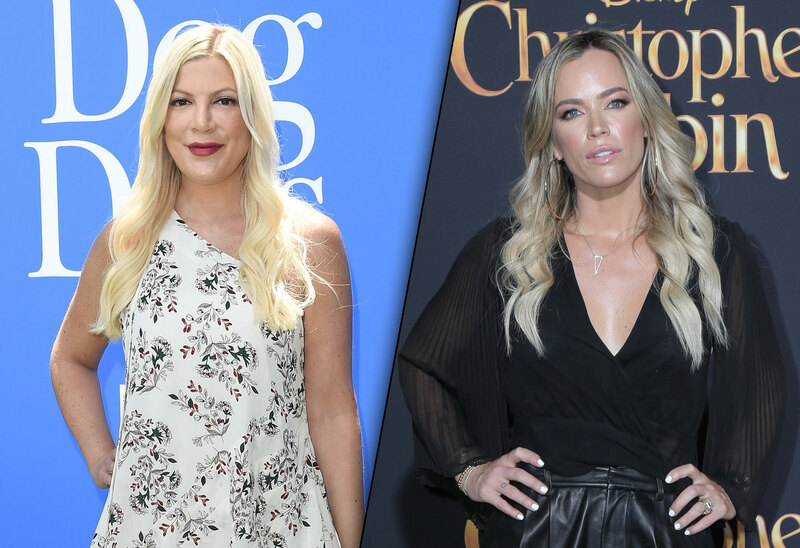 As previously reported, Tori Spelling hired Teddi Mellencamp Arroyave as her accountability coach to achieve her fitness goals after welcoming her fifth child with husband Dean McDermott. Now, just a couple of month, Tori has nothing but positive reviews about hiring the Real Housewives of Beverly Hills star. "Teddi and I met through a mutual friend. With my other four kids, the weight came off—I worked at it but it came off relatively easy. The weight after my fifth child, after Beau, didn't happen," she told E! News. "I felt kind of stuck in the weight world." She continued: "I started working with Teddi and it's been life changing. My confidence is like through the roof. " So now that Tori is working with Teddi, does this mean that she may be joining RHOBH? "I mean, I am the O.G. Beverly Hills girl. No for real, I grew up in Beverly Hills," Tori joked. "They've never asked me." In the meantime, Tori is focused on a variety of projects including Beauty with Tori. The actress is also hopeful for a Beverly Hills, 90210 reboot at some point in the future. "There's definitely been talk about it. We're definitely all still friends. We love each other and would love to work together," she told E! News. "At this point, we feel like we were the O.G. and there's been a lot of reboots of other shows and we want to take our time and really do it right and not just give you the plain ole, ‘Hey it's the reboot. Now we're in our 40s. Here's life.' We want to do a different version of a reboot and it's definitely going to be something that's going to wow people and we're all talking about it right now."